SJMC major (and Senior Achievement Award winner) Clare Milliken has created a really nice blog called “Reporting Race.” She mixes the usual media commentary one might expect from a blog with firsthand research and some really astute analysis. Today’s blog rescue reprints one of her recent posts, ” Content analysis shows stark differences in immigration standpoint”. As a complement to my last post, I thought I would include the results of a recent content analysis on immigration. I conducted this analysis as part of a class on mass media and public opinion. I chose to compare Mexican immigration coverage in both Newsweek and U.S. News and World Report. I examined 25 articles for each publication, randomly selected from 2000-2009. 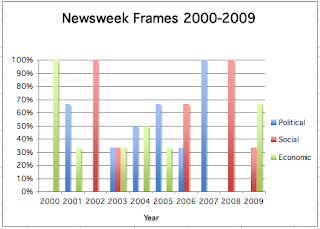 I studied both the frames and valence of each article. As for frames, I looked at whether the article presented the story within a political frame (emphasizing policy, political actors, etc), an economic frame (a cost-benefit analysis of reform or current immigration policy, mention of a financial component–need not include specific figures) or a social frame (impact on immigrant families or deported immigrants, the “human” side to the debate). As for valence, I determined whether each article was pro- or anti-immigration. The pro-immigration articles used words like “legals,” “migrants” and “amnesty.” These articles emphasized Mexican immigrants as hard workers determined to find a better life. By contrast, “alien,” “illegals” and “deportation” signaled an anti-immigrant tone, as did mention of Mexican immigrants as “free riders” taking our jobs and draining our welfare programs. 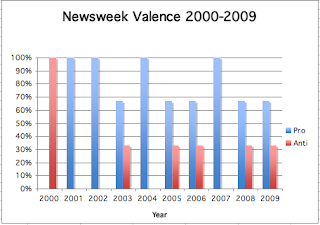 In the event that both pro- and anti-immigration words appeared in the same article, I determined valence by the more frequent of the two. Why might this be? Well, the valence of each publication’s immigration coverage corresponds to its partisan bias. The lack of a landslide majority for any one frame reflects the diversity of newsmagazine content, which is frequently divided into politics, business, arts/culture and technology. 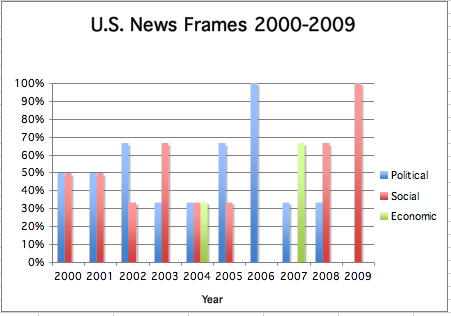 The publications may also choose frames based on which would support their position on the issue, which may explain U.S. News’ lack of economic frames. If they thought the economic angle would lend support to the pro-immigration side, U.S. News’ editors may have scrapped that frame at the morning meeting. 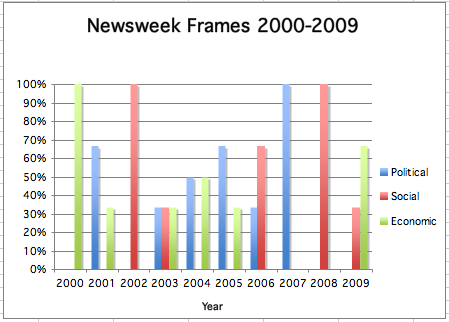 My analysis stands as a warning to all your devout Newsweek and U.S. News readers: If you read one, read the other. You are not getting a full picture of the Mexican immigration issue from either of these magazines. Better yet, read and listen to a whole host of sources. 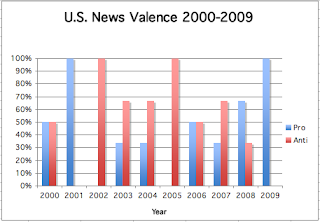 Bias is alive and well, and if you want to make smart decisions, triangulate your news consumption.